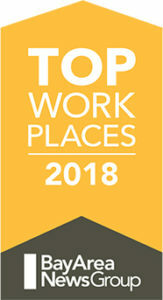 Newark, Calif., June 25, 2018—RoseRyan, a nationally recognized consulting firm that offers finance and accounting solutions to take companies further, faster, has been awarded a 2018 Top Workplaces honor by The Bay Area News Group. This is the fourth year that RoseRyan has made the list, ranking #19 among small businesses. The Top Workplaces lists are based solely on the results of employee feedback. The list appeared yesterday in a Bay Area News Group supplement found in media outlets around the region, including The Mercury News. RoseRyan employees believe the company is a very positive workplace, is moving in the right strategic direction, and has excellent communications to keep everyone informed about important decisions. Its workforce appreciates the very high level of cooperation and collaboration within the firm, and feels it’s a part of something meaningful. RoseRyan earned high marks on overall efficiency and execution, while actively encouraging new ideas and valuing different points of view. Conducted by Energage, the confidential employee survey behind the list released yesterday assesses employees’ opinions about their jobs and their alignment with the employer’s long-term outlook. “Becoming a Top Workplace isn’t something organizations can buy,” comments Doug Claffey, CEO of Energage, about the annual competition that distinguishes businesses with healthy workplace cultures. RoseRyan is hiring accounting and finance professionals across the board for finance engagements throughout the Bay Area to take on meaningful engagements at dynamic companies, with an emphasis on the tech and life sciences sectors. Learn more about our part- and full-time positions here: https://roseryan.com/about/careers-culture/. To start the conversation about a career in finance and accounting consulting with RoseRyan, contact its talent manager, Michelle Hickam, at mhickam@roseryan.com. Energage (formerly known as WorkplaceDynamics) specializes in employee feedback surveys and employee engagement. It has surveyed and studied over 47,000 organizations since 2006 representing well over 16 million employees in the U.S.
An award-winning consulting firm based in Silicon Valley, RoseRyan takes dynamic companies further, faster, by delivering specialized finance solutions at critical moments. We’ve been the finance dream team for 25 years to more than 800 companies at all stages of growth in the San Francisco Bay Area and beyond. Along the way, we’ve also enjoyed national recognition for our leadership and innovation. While we focus on the tech and the life sciences sectors, we consult with companies in any industry to boost them through finance challenges. Across all stages of their journey, for companies large and small, we accelerate startups, help manage growth, tame tricky transactions, and conquer complexity. Learn more at www.roseryan.com.